Setting: Deep in the Wood of Sharp Teeth, beneath the ground nearing the heart of an underground orc hive two very different warriors - Lia'Dris and Boris - meet by chance at a crossing of tunnels and are set upon by worgs and warriors. Lia'Dris Maendellyn (Player Name: jonez2610): A slender and small elflady with coppery skin, a pair of bright green eyes and a shade of caramel brown hair with strands of gold. She seems nimble and agile, swift on her feet and is most often clad in a suit of elven armor and equip with a spear and trinkets of similar light and minimalistic style, yet obviously high quality craftmanship that all attest to the fact she is a wood elf. She carries herself with a natural elven grace and seems to observe her surroundings with keen eyes and a cautious approach. Boris Vyacheslav: Blackened steel armor encases every inch of this herculean knight's body. His physique is obscenely predatory - his musculature is exagurated by permanent transmutations - surely inflicted from a young age. It seems this man may have been engineered by wizards for violence. A Balor's visage is tattooed into his head - runes of pain and fear are tattooed on his sunken cheeks. His brown, kohl lined eyes seem cold and dead when he looks at you - though the perceptive may sense a deep seated hatred in his heart. Boris Vyacheslav: "Need you any help there?" Boris Vyacheslav: "Aye. That is the task." Boris Vyacheslav: looked beyond the elf to the orcs firing then back to her. "What about some...friendly competition then?" Lia'Dris Maendellyn: "What they lack in wits they add up for in stupidity." she mutters and drives the pole through he near death orc at her feet. "Hmm.. I do not know you, and I meant not to impede your hunt or steal your quarry. Merely culling the filth that dwell here." Boris Vyacheslav: "Shall we deal with those cretins behind you?" Lia'Dris Maendellyn: "Dim witted cretins indeed." Battle is joined - the pair slay a warband of orcs and worgs. Lia'Dris Maendellyn: "Alas, I shall not steal your sport, stranger. And will leave you to the.. exercise." Boris Vyacheslav: the warrior thrust his sword hard into the baked earth. Taloned gauntlets clutch his visor and draw it off his head - revealing a perspiring face heavily tattooed and unhandsome. Boris Vyacheslav: "Before you go, sate my curiosity.... are you one of the elven village I hear rumored to be in this woodland?" Lia'Dris Maendellyn: "No, I would not claim so. Have you quarrels with them?" Boris Vyacheslav: leaned an elbow on his standing sword, helmet under his other arm. "Not any more, no. My former lords had a long standing hostility with them..."
Lia'Dris Maendellyn: "How.. intriguing. I can not say I am affiliated to them in any way, nor would I know any of their citizens by name." Boris Vyacheslav: "I am Boris Vyacheslav, of Surthay in the far east." Lia'Dris Maendellyn: she grimaces a bit as he nose wrinkles and her nostrils flare up. "That is further east almost than I hail from"
Boris Vyacheslav: "From where do you hail, then, she-elf?" a hairless eyebrow rises slowly. Lia'Dris Maendellyn: she smirks and squints slightly at the man, hesitating a moment before smiling sweetly "Algarond." Boris Vyacheslav: the corners of his cold lipped mouth turn up in a gargoyle smile, a low laugh rumbling out. "Algarond! Beloved neighbors, then, is it?" Lia'Dris Maendellyn: "Something of the sort." a coolness to her voice as her mouth twitches. "My name is Lia'Dris, should such hold any value. Tell me.. to whom do you pay homage Boris? Boris Vyacheslav: the kohl-lined eyes of the Thayan hardened, but gleamed like obsidian with his amusement. "Hail Lia'Dris. Homage ... Do you speak of the gods?" Boris Vyacheslav: unlatched the strap of his pauldron and flipped it back to reveal where the orc sword pierced his chainmail and gambeson. He pours from a small glowing vial which sizzles in the wound bringing the filth and rust and blood out, sealing the meat messily. Boris flipped the pauldron back over and latched it himself as he spoke. "I was a lord of an estate in Surthay... It was in the last year utterly decimated. Before I left to war for it against the Rashemi, I was Knight-Commander of the Order of the Crimson Guard at the Thayan Enclave of Baldur's Gate. The Khazark at the time of my service was Kahanak Habdilof. Before this, again, I served Thay herself in the military, and many a campaign." rest again against the sword standing in the filth. The orcs about his feet ponged, flies quickly swarming the kills. Lia'Dris Maendellyn: her intense elven gaze seems fixated on his markings rather than the wound. her expression sours visibly, the scorn in her voice reveals a prejudice deeply rooted in the elf. "Hollow words of would be corpses, ever the warmongering ilk. The Simbul would be glad to hear of your failures, for that is truly all your kinsmen can boast. Perhaps I have met you on the field of battle in the past, though he horrid visages that your helmets are often styled by would differ little from what I behold now." Boris Vyacheslav: "You are far from Algarond, Lia'Dris... is it a desertion of duty? Are you quite secure leaving your borders unguarded?" Lia'Dris Maendellyn: she chuckles softly, if briefly "Lest your superiors have found measures to melt the lower planes in to this, the Sorceror Queen shall be capable enough without my spear. Yet it is not desertion no, my duty is eternal and the nightglade remains unsullied by the hands of Thayvian mongrels and their filth. I have my own reasons for this voyage and not due to crueler men barking orders at me, or are you perhaps ascending from the depravity of your station?" Boris Vyacheslav: the large knight left his sword standing and approached the hooded woman of Algarond slowly, his blackened steel sabatons crushing underfoot the tangled limbs of orc and worg. "I admire your spirit. Many a man of Algarond has fallen to my sword - but here, of all places, I never anticipated the ghosts of Thayvian war to follow." Lia'Dris Maendellyn: a calm demeanor is evident, her grip of the spear pole tightens ever so slightly but her stance seems at ease, raising her chin she smirks "The ghosts of war follow us to the grave and beyond, perpetual is the struggles of the planes and no less so for those whom seek to enslave and opress others beneath the heel of their boots. I am surprised you are not met with scorn and mistrust, even here. For the deeds of your kin are widely known as transgressions against all things fair on Faerun." Boris Vyacheslav: the giant approached quite near - so that the fire underlit his gargoyle face in a quite unflattering way as he looked down upon the woman, his face sterile of emotion but eyes glued to the elf with wonder. "I am met with scorn and distrust, as any coward meets a conqueror. The most ambitious empires will always be despised, Lia'Dris, but conquest is the natural order of life." He paused. "The great are hated by the small." Lia'Dris Maendellyn: she pulls back her hood as caramel strands of hair fall freely on her shoulders, there is no trace of anxiety or fear in the elf and her features easily give away that she has seen her share of conflict and battle. she shoulders the spear, assuming a more casual stance as her eyes squint at the gargoyle faced man. "The most ambitious of empires fell to ruin in ages long forgotten by those who would proclaim superiority of others in the present. Your shall crumble to dust as well, in due time. Perhaps far sooner than you can anticipate. 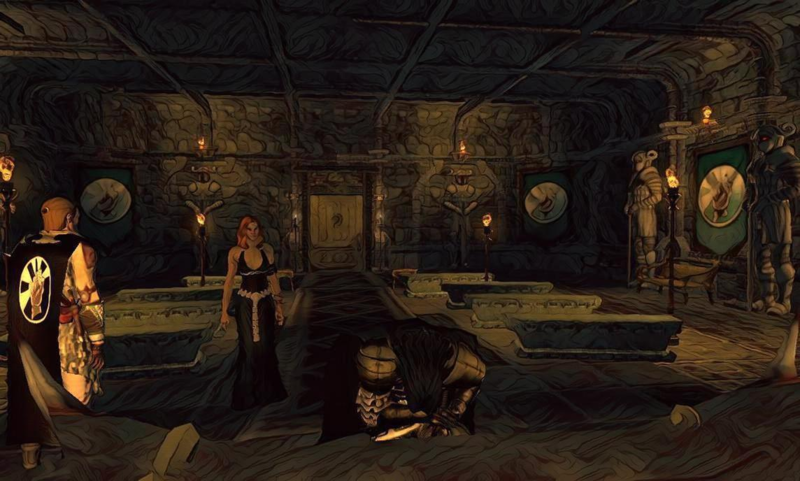 Boris Vyacheslav: dull obsidian, shark like eyes shift slowly over the face of the veteran wood elf standing before him, taking in her features. He does not seem to have blinked since the conversation began, lending a strange intensity to the man. "Thay will never fall." Lia'Dris Maendellyn: "And you would assume to be the first making such bold statements?" she seems slightly amused, a faint hint of a teasing smile crawls over her lips, her eyebrows raised as she shakes her head subtly. "As did the Netherese.. and before it, so did we." Boris Vyacheslav: the upper lip of the fighter lifted to bare his teeth, his stare darkening at the teasing an amusement of the elf. His accent seemed to thicken. "You speak of the race of elves?" Lia'Dris Maendellyn: "The Yuireshanyaar once thought as you do, as did all of the old elven empires. But in the wake of such notions of grandeur, war thrives and follows. Only the cycles of life and death is persistant in this flow of chaos we call existence. I speak of the races of all whom have set foot upon these planes, claiming to be its masters or stating the endurance of their rule. History is a lesson for the future, one ought not to ignore, Thayvian." Boris Vyacheslav: the plated chest of the Thayan swelled, his great plated shoulders slid back and taloned gauntlets locked behind himself in a relaxed military stance. His bulldog jaw visibly flexed as the elf spoke, listening in silence. Lia'Dris Maendellyn: her gaze idly averts to her hand, with open palm she turns it over and shakes her head as a brief sigh emerges from her pursed lips. "Blood washes off slowly, take the lessons to heart for each drop spilled, we are but fuel for this plane and the gods." Boris Vyacheslav: eyes lowered to her hand at mention of the gods and history. "Unlike many of my brethren, I have not disregarded the folly and fall that occurred when my ancestors set themselves above the gods. You are a woman of faith?" Lia'Dris Maendellyn: she chuckles softly and stiffles it only to respond with a tone full of sympathy and pity. "How peculiar and rare. I thought the mere accumulation of power and rise of station was the sole purpose to life, for a man of your.. heritage." Boris Vyacheslav: "There are gods who champion such purpose." Boris Vyacheslav: his cold lipped mouth downturned at either end into a foul grimace, wrinkling the fine scars crossing his face from all directions. "Few elves speak with me - less as plainly as you have in this den of death, Algarondan." Boris Vyacheslav: "I am not perplexed by the aloofness of an elf toward a man any more than I should be perplexed by the way a slave stands aloof of his master, until brought to heel." there was in the pits of his eyes a smoldering wroth. "You would grant me release? Then mark well my face and know me now." the warrior neared another step, a tower of plated steel and unnatural musculature. Veins surfaced on his bull neck and emerged on his brow and skull. "I know what lies beyond for me." Lia'Dris Maendellyn: "Would that I could erase such unwilling memories, yet it shall haunt me in reverie till the sourness of your lips curl upwards in gratitude for the end of your deprived exsistance. But alas this is not the day you die, Boris of Thay." Boris Vyacheslav: the nostrils of the auroch of a man flared, as if hungry for oxygen to feed his raging heart. His breath smelled stale of bitter wine at this proximity. "By the hand of Thay, Bane will crush Algarond - whether I live or die." Boris Vyacheslav: turned his back to the spear maiden and marched slowly back to where his greatsword stood. Grim blizzard winds barraged Darkhold's mighty walls and black towers. Within the sanctuary of the stronghold in the fighting pits of the castle garrison a great figure in blackened platemail stood apart from every other man as a wolf among dogs. He was Bueroza. His reputation widely preceded him as an ultranationalist of Thay, yet a traitor of the Magi powers that be. The knight paced along a disorderly line of unwashed northmen in tattered and varied garments, addressing them through the cruel mask visor of his ridged great-helm, clutching a large flail in his iron grip. "The uncivilized man is low - he is a barbarian. He wants not beyond the lust of his flesh. He sees not beyond the needs of his stomach and does only what he must to secure his welfare. There is no real power in him. To a higher calling worthy of struggle he is deaf. Too blind to perceive transcendence and cause worthy of striving in, too dull for any awareness of mortal destiny. He is by all means a beast. You are beasts. Lawless men and rightfully pariahs from what is so-called civilized in this savage sprawl of coastland. To this day, is it not true you have made your living as predators on the weak and the civilian? But you are NOT the greatest predator to walk these blooded shores!" The Banite halted sharply, siezed a man by the jaw by his taloned gauntlet and stared down at him in the face, domineering. He shoved him aside with disgust to resume his slow pace. "There is not a budding city-state in this miserable realm that compares to the ancient grandeur and high order of the Thayan Empire; no roads of Thay have known banditry like yours in centuries. That so called ethical objection of these Western rulers to enslave and utilize the lowest among themselves in honest labor leaves worthless men as yourselves rather to roam unchecked, using your freedom to range bloodthirsty and criminal throughout the realm and its communities. I do not believe you are without an intrinsic purpose or value. Even the least of men in this, our Hierarchy, has an imperative part to play in the total. He has his place and his purpose. Each man stands before another according to his quality. Until today you have not participated in the New Order to come. But now you will. By Bane, you will." Boris looked down from the height of the keep upon the training grounds where the same men he had welcomed that last ten-day were being put through their paces in basic militant drills. Each had signed his life in a year's contract and received brandings marking him as a soldier. Black bear-furs decking Bueroza's wide shoulders were tussled by the wind, his iron jaw clenched and eyes alight and fiery in the harsh cold of the north. For a moment, perched as an eagle on the heights, he felt again a commander of men as he was in those armies of Thay and her Order of the Crimson Guard. But it was a fleeting vanity, and left in him a sore hollow. Such days of glory were behind the fallen knight now. Marked a traitor by his own countrymen, whom he loved more dearly than his own life for want to serve, he was eternally isolated from his people and Empire. White hot hatred cleared his mind and heart a fresh slate. It was scrawled on his soul; the Thayan Empire would rise and rise again, and know the glories of victory over the barbarian hordes of Algarond and Rashemen. This not by the repeatedly failing leadership of those many squabbling Zulkir - but rather by one hand. The Black Hand. "Where are your masters, pet? Are they not with you?" Boris stood perfectly still - a statue in the heavy downpour that slicked his purple cloak to his black platemail. Kohl-lined eyes glared from the steel pits of his gargoyle faced visor. Only the rise and fall of his massive plated shoulders betrayed a life. "Prepare to die!" the Rashemite axemen bellowed from the bridge, frothing at the mouth with rage. The knight was dismounted from his warhorse Xenubat on the well traveled rise overlooking the Boreskyr Bridge. A dark tower stood a silhouette against the travelling moon and its entourage of debris while further in the distance Dragonspear loomed, ominous and old. Though the barbarian was fast, and long of leg, Boris overran him with a powerful charge before the end of the bridge. His unholy sword broke down on his back like the merciless rod of a slave master administering punishment. Once, twice, three times, four. The Rashemi snarled, thrashing blindly and, rather than defend himself further, continued to flee in the direction of Soubar as soon as he had his footing. The burning bridge behind them cast a bright light that refused to hide murder from the eyes of the dark gods who watched. Msciwoj the Berserker, near to death, slipped and scrambled clumsily up the steep muddy rise to Soubar as the rain poured down. Boris was immediately behind him in another powerful charge. Tossing aside his tower shield Boris came to stand overtop of the barbarian. He pressed a boot on the low of Msciwoj's back pinning his belly to the dirt and preventing his escape. Now, sword raised point down in both hands, he dealt death's knell; with sore wrath he drove it, pinning the man to the earth. The blade whined negative energy, satisfied at last. A twist of the blade, and then it was wrenched free, sending that barbarian's soul to whatever hell awaited him. Bladed fingers carved into the cold earth to bring a fistful to his bullish snout. Nostrils flared to devour the stench, eyelids fluttering closed as he remembered the Rashemi blood that permeated the same ground this time almost two years gone. When his eyes opened they were vacant - shark-like. He was in a warrior's trance, reliving the bloodshed. In grim silence his large hand lift and the talons unfurled. Kohl-lined eyes glared as the thick mud dislodged and slopped in clumps to the ground. The same gauntlet dragged down his staring face, opening the skin of his brow and cheek with its deadly claws, debasing his countenance with filth - in his minds eye, only dressing himself again by hands drenched in the blood of a hated enemy. When he awoke again he arose with ease from where he knelt. The titanic monolith of blackened platemail ascended the battle-saddle of his Tyranturan steed and, with cruel vigor, drew the reigns and dug his barbed heels into the ribs of the muscled beast barking a cry of command. The equine reared up with an ungodly shriek in the still night air, casting horror afar. Falling onto its hooves it charged with abandon into the abyss of night, moonlight failing under impenetrable forest canopies of a lonely wilderness road. Temple of Tymora, Baldur's Gate. She sits, plucking up the deck. "Would you accuse yourself of being a superstitious man, Boris?" "I learned to do this as a child, from Magdalena. She is the one who gave me my first reading," she explains, as she idly shuffles the deck "but it was not until a year or two ago. I revisited Rhiannon, a changeling from Rashemen. She taught me how to use magic upon the deck. It... adds a bit more intent to the fold." "Rashemi magick..." Boris muttered, unimpressed. "Not Rashemi at baseline. But learned in Rashemen. Complete difference. This is a trick from all around the world." She smiles gently, then continues to shuffle the deck. She sings some sort of song as she does so, soft and soothing; it resembles that of a chant. Her shuffling hastens as she voice echoes, her fingers seeming to consider each card intentionally, though faster than one might normally wade through a deck. Eventually, four cards are placed horizontally upon the man, all face-down. She motions to the cards, from left to right. "Let us explore what lies behind you, with you, and before you." Pauses dramatically, for any possible reaction to her theatrics. The warrior sat upright in his chair, straight backed with shoulders wide. His gauntlets sat as fists on the table. Dark eyes watched the hands of the woman as she worked the kind of witchcraft, then raised to meet her gaze stoically, giving little to indicate what manner of expectation he might hold in his breast. "First, we must analyze the past." She inclines her head - her eyes faded and smokey. The first card is flipped: Knight of Swords. 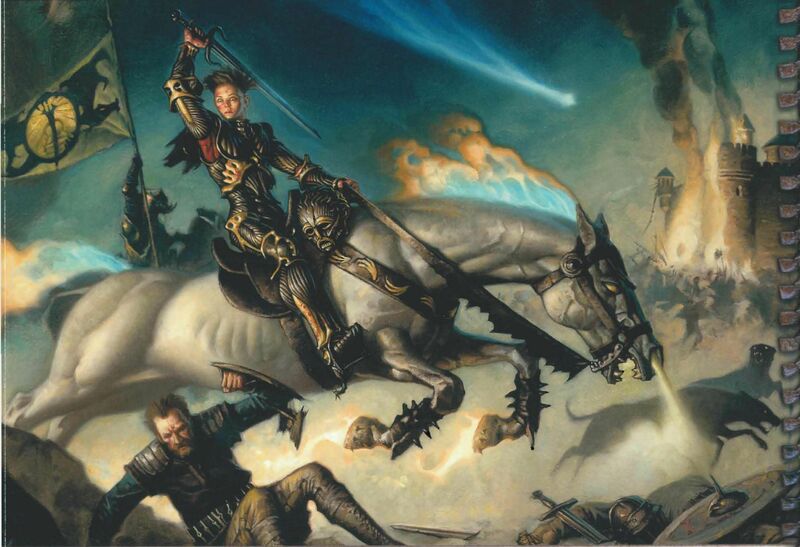 This card depicts an armored man atop a white horse, charging in profile into battle. He holds a sword forward as he charges. "Mmm. A man on a mission, charging to his goal. He is ambitious, dedicated, and so set upon his dreams that he will stop at nothing to accomplish them." A twitch of his eyebrow at that. "He tends to be quick to take action. He may be inclined to plan ahead, but he generally has a tendency to not plan far enough ahead." The hands of the knight flattened out from their fists and came together, bladed fingers interlocking partially. His eyes narrowed on the card, reflecting on the words of the woman. "... Does this imagery seem familiar to you?" she asked. "Would you like to move on, or ponder this one further?" She inclines her head. "And with you; that which is happening, or in the midst of coming;" 4 of Pentacles was played. This card depicts a finely dressed man with a crown, clutching a large golden coin. Two other coins are held under his feet, another atop his crown. ".. An accomplished man, though one affected by his ascension. He has earned much, but he clutches to that he has gained, intent on maintaining control of it. Strange, one might think. He may have reached such heights, but he spends so much time maintaining it that he may not have time to do anything else." One hand lift and groomed down through his beard slowly, eyes on the card. A slow nodding. "So far your spell is true. Go on. What is my future?" She inclines her head. "What is to come, yes." She flips the third card; 5 of Swords. This card depicts a man holding two swords in one arm and a third to stand upon. He looks in triumph as two contenders depart, their shoulders slouched in defeat. Two swords rest on the ground before them. "A time of falling out, or disagreement. The enemy leaves in disappointment, as if giving up. The one left finds victory in the moment. However, the storm clouds are coming in from the horizon. All is not well, despite perceived victory. This speaks of a time to come in which one must choose their battles carefully." An ebony, sharpened finger nail hovers above the fourth card as her foggy gaze looks at the man. The fourth card remains face-down. "And this last card... what does it represent?" the man asked. "This card is the influence. The struggle. The strength. It could be many things, pertaining to the future. It is a card to ponder, and act accordingly. The past is already written, the present is unfolding, and the future is uncertain." "Show it to me." Boris reclined back in his chair, expression as hard as stone. She waves her hand, her gaze fading back to normal as the card unflips and slides to rest in front of Boris. She blinks and looks to the card, tilting her head. "Huh... Observe the imagery, interpret for yourself. Within the next moon, if you wish to discuss it, we may discuss it. This card is best interpreted by the one who is living the story, not the one reading it. All I can offer is, this card very rarely means its literal depiction." "Portentous tidings you've dealt me, bardess." "I believe they are hopeful." It was midnight and the altar was drenched. The bare body of a woman lay upon it, lifeless now, and before her stood Bueroza - a tower of cold wrath. There in the heart of the temple of The Black Lord the champion of Bane was as naked as the day he was born. His great limbs, bare chest and strong stomach were splattered with the warm blood of his offering. A nearby acolyte robed in black from head to toe approached and received the ceremonial morningstar yielded by the herculean knight. Kohl-lined eyes turned up to the dark green stained glass window through which full moonlight beamed onto both his emotionless blood-freckled face and the foul deed he had wrought in the name of favor. Serve no one but Bane. Fear him always and make others fear him even more than you do. The Black Hand always strikes down those who stand against it in the end. Defy Bane and die - or in death find loyalty to him, for he shall compel it. 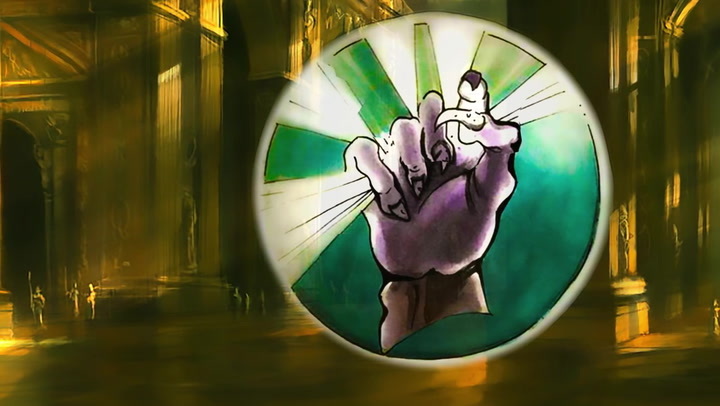 Submit to the word of Bane as uttered by his ranking clergy, since true power can only be gained through service to him. Spread the dark fear of Bane. It is the doom of those who do not follow him to let power slip through their hands. Those who cross the Black Hand meet their dooms earlier and more harshly than those who worship other deities. Violence is the father of authority, from which all power is derived. The battle axe is transcended, enthroned above the quirks of philosophy and culture. The sword is the reserve that guarantees Order. A tyrant is born from the blood of his subjects. Three subjects, endorsed and approved by the Clergy of the Black Hand, must give a pint of their own blood in devotion to you as a Dread Knight. 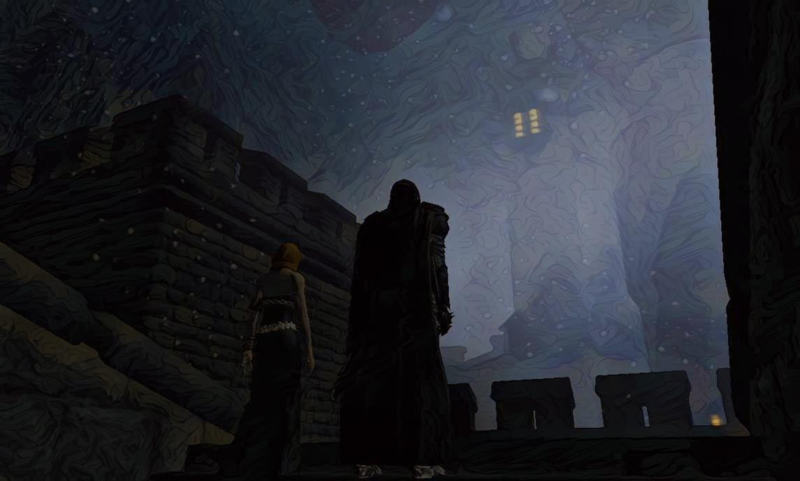 Bueroza and Telula emerge from the Temple of Bane into the eternal winter blizzard of Darkhold's highest plateaus. The ceremonial altar is prepared by Bueroza. Subjugated over the altar Telula rests her cheek upon it with her arm in the blood channel and his iron grip on the back of her neck. "Lord Bane," he prays, the sacrificial Banite dagger pressed to her arm, "witness the Rite of Tyranny by your Dread Novitiate! In obedience, this blood is shed in devotion to me as Your Dread Knight - and I offer it in devotion to You." Telula's blood collects in the channel and wells into a black glass pot. When the letting is done Bueroza collects the vessel and seals it, staunches the wound of the woman, and leads her into the inner sanctum. 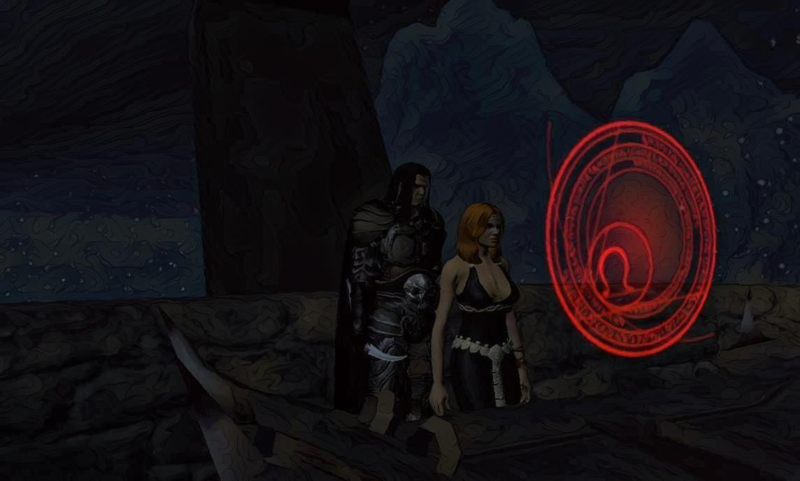 Bueroza presents the pint of blood to the Priest of Bane serving the cult at the temple. It is carried by him through the unholy veil of darkness to the true altar of Bane for offering and approval. Bueroza - Dread Novitiate - remains knelt at the common altar, contemplating the terrifying reality of the Lord Tyrant under the watchful eye of the Lady Telula, his first subject in the Rite of Tyranny. Zeeta Thulkist climbs the stairs, holding her gown and lifting it at the knees. She looks to the dire wolf within the circle briefly, eyes cool and expression unchanging. She stands resplendant in a gown of purple silk. Hair and fabric whipping in the wind. Telula sat still on the cold stones, the wolf's keen eyes set on the woman. The blustery wind blowing her thick fur all directions. Already the cool air renders Zeeta's pale skin almost blue-white, but she holds her chin high and proud, refusing to submit to the cold even with the merest, slightest tremor or shiver. The wind-blasted Thayan stood with his back to the prepared altar. A large, sacrificial Banite dagger was worn on his belt in an ornate ceremonial scabbard. His frosted hair clung to his savage brow as his kohl-painted eyes scanned the courtyard below. Telula's keen eyes slid from the purple dress towards the altar where Bueroza stood, watching him silently while the wind ruffled and frosted over her fur. Bueroza's great arms fell and he turned to face the arrival of Zeeta. Bare-chested, the network of infernal tattoos that webbed across his skin were cut with many scars and cruel burns. The great wolf would rise to its four paws, padding softly to the side , as if to allow Zeeta to pass her. Zeeta eyes his wounds without pity or the slightest hint of emotion. Turning slightly towards the Banite warrior, mirroring the wolf, to form the third point of a triangle upon the roof, yet never once crossing into the circle burned with arcane energies upon the stones. A black gauntlet beckoned Zeeta to join him at the altar. Telula would sink down to her belly after moving to the side, resting her big head across her crossed paws, her eyes set on watching Bueroza and the altar. Upon being regarded by the great warrior, Zeeta stands, if anything, prouder than before. She allows the skirt of her gown to fall to the frigid stones, then takes five, slow, regal steps towards the alter, making of her gliding progress a solemn and ritual procession. The dagger was strangled in his iron grip and broke out from the scabbard very slowly. Zeeta claps her hands together, honouring the altar and the one who stands before it. She looks skyward before spreading her arms wide to either side, palms upwards, silently imploring the Tyrant God to observe the rite. After performing a small ritual gesture with the blade before the altar the Novitiate outstretched the weapon to his side and put his other hand forward, open to sieze the wrist of Zeeta, inviting her to lay it in his palm. With proud, regal grace, she slowly extends said arm to the Banite, not placing it within his palm, but holding it a hand's breath distant, that he must cease it, for all that she is willing, and demonstrate his power over her before Bane. The pinprick pupils of the Thayan dilate, his upper lip retracting to bare his teeth as his vice grip seized the mage's wrist, closing it in his taloned fist. His bulldog jaw clenched firm shut as he forced her arm down to rest flat on the ice cold obsidian, her body obliged awkwardly to accommodate the descent. She gasps at his iron grip, eyes widening in her first, true expression of the evening, lips twisting in discomfort. Yet as she's pulled down, she looks up at him still, chin resting on the cold stone, offering him a cold, approving smile. Bueroza's hands, familiar with murder, handled the dagger expertly and ruthlessly, pressing the curve of the edge to the inner arm of the mage. He stared down at the woman coldly, his blue lips parting to speak. "LORD BANE, LOOK UPON THE RITE OF THE TYRANT!" He turned the dagger, opening a wound on Zeeta's arm. Zeeta flinches at the burning cold touch of the near-frozen steel, but regards it's wielder with something approaching awe-struck devotion. Cold zeal in her eyes, even in the moment her lips twist in pain and blood is drawn from her snow-pale skin. Bueroza held the arm in place, the blood relieved from the mage trickling down the cold channel and welling together in a black glass pot. Telula's eyes glanced up towards the sky breifly before settling back on Bueroza. The wolf laying unmoving except for the occasional flick of her ears. Zeeta's eyes never waver from his, her smile cruel, even while her eyes grow heavy from the bloodletting. As the pot fills, the cold finally takes hold, and she begins to shiver, though never once giving voice to complaint. Instead, she mutters a constant mantra in praise of Bane, and of his favoured son. "Hail Bane. Hail Bueroza. Hail Bane. Hail Bueroza." The heaving chest of the aurochs of a man expelled a frosty mist from his flared nostrils. A zealous rage in his eyes, he released Zeeta's wrist suddenly and let her numb arm fall back to her. She sways then, but only for a moment, pressing her blood-clean hand down upon the stones to steady herself. Then, after a moment, she rises. Proudly. To her feet. Chin held high. Back poised. Refusing to be swayed by wind or hail, yet with her eyelids fluttering from weakness, blood loss, and the deadly, perishing cold atop the tower. The ceremonial dagger was sheathed again on his belt. The scowling goliath's lips parted again. "Present me the blood." Telula sat up slowly, glancing from the weakened woman towards Bueroza, waiting for him to cue her. Zeeta obeys without question, reaching out with both, numbed hands near white from cold. She grasps the receptacle of her blood, the grail, with both palms, raising it up that Bane might see it, before rounding the alter to descend, with difficulty, to her knees. She presents the goblet, thrusting it towards him above the height of her own head, even whilst her lifesblood seeps still from her wound, to drip, near frozen, to the frigid stones below. Bueroza received the black glass container in his gauntlets and turned to the altar once again, raising it now above his own head - as it was offered to him, now offered to Bane. Zeeta rises shakily to her feet, taking a single, stumbling backwards before falling to her knees once more, raising her gaze in fervent devotion. After a time, Boris lowered the offering and rest it on the altar. There was a dark fervor in his gaze as he stared ahead, inhaling the chill winds greedily to swell his barrel chest. Telula stood up, padding closer to the Altar. His dark gaze turned onto Telula. "See to the Lady Thulkist's injury." Her big furry body broke the freezing wind, the dire wolf looming over Zeeta as she approached. "NO! No healing spells. A sacrifice made must BE a sacrifice." She merely looks up, dark circles of exhaustion beneath her eyes. Deathly pale. "Bind my wounds. But no magic. Not so much as an orison." Bueroza's primitive brow knotted, regarding Zeeta a long moment in silence. With a low grunt of approval for what she determined he showed a hand to Telula to desist. Telula stood near the knelt woman, offering her relief from the freezing blasts of air whipping over the top of the tower, shifting her hazel eyes over towards Bueroza again. After some pause, quite unceremoniously, Bueroza turned his back to Zeeta - leaving the fate of the weakened woman on the frozen tower to her own hands. He began his descent from the tower. Telula would give Zeeta one firm snout shove to try to get her moving before following after Bueroza. Zeeta looks up then, eyes heavy, to watch his departure, before drawing forth a dagger to cut a strip from her dress. Slowly, as though finding concentration difficult, she binds the tourniquet tight about her forearm. Telula flicks her tail, glancing back one last time. Zeeta makes her way down the stairs, supported between two Zhentilar elites, though begrudgingly so, giving both men venomous looks. On seeing Bueroza and Telula, she shakes them off, angrily descending the last few steps alone. Proudly, she announces, "I shall be retiring to my quarters. Hail Bane." The direwolf was gone, and Telula had returned, watching Zeeta make her way down the spiral staircase silently, watching just as the wolf had. A small smile cracked across her crimson painted lips. "Do not die." 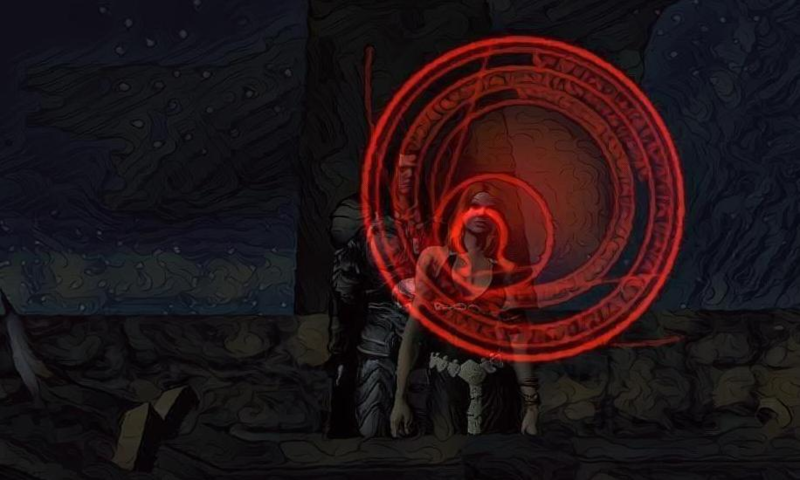 One of the Zhentilar attempts to take her arm again, only to be shaken off. "Hardly." She replies. The young mageling manages to cross the antechamber in a few haphazard, staggering steps, before vanishing through the door. Lady Blackrose looks to the altar, "Can you not feel it?" she holds her right hand over the altar, "The power, His presence!" "Of course." the Thayans pupils were dilated so large his already dark eyes seemed shark like. "Unlimited strength." "What do you require of me?" the woman asked. "My death? Or just my blood?" Bueroza prepared the altar and set a black glass jar in the receptacle of the blood channel. The lady takes the dagger and places it on the altar then kneels before the altar. "Before this altar I willingly shed my blood with the same dagger used in my creation. Liches Bane, may my blood further your will and enhance the Journey of another dedicated to your will. Hail be it to you My Lord. I am but a aspiration of your will." She would then grab the dagger and cut deep into her left hand. Blood would begin to flow and she would hold it over the jar. As the jar would begin to flow she would stand tall until it could contain no more, then she would pull away and back off from the altar. Bueroza's kohl-painted eyes glared down on the act of devotion occurring before the altar. His armored body perfectly still, like a statue, but for the rise and fall of his plated shoulders as he breathed deep the ancient air of the ruins. Her Gaze would look toward Boris awaiting him to continue on. Bueroza his head bowed gratefully to the Lich Queen. He changed his poleaxe to the left hand and knelt to take the jar of blood in his right, raising it over his head and the altar. She would look on watch the ritual, Composed as always, He red gaze locked onto the altar. "Lord Bane! This blood is pledged to your Novitiate for the Dread Knighthood of the Order of the Ebony Scepter! Behold now, the completion of this ancient Rite of Tyranny! Approve this offering from your servant... to your glory, O Tyrant Lord." His chest swells with a deep inhale, gradually lowering the jar of blood to rest on the altar. He rises, sealing the vial with a black glass and cork plug. Handling the glass pot with great reverence he placed it carefully into its own carry pack to return it to Darkhold. "Lady Blackrose. You have done me a great honour. The Rite of Tyranny is complete!" The dagger in her hand would glow seemingly absorbing the blood on the blade. "Very well. I am honored to be a part of it." "I will guard your offering with my life. It will never see the light of day outside of the Temple of Bane." "My Blood, Is unlike any other. Guard it well." The Rite of Tyranny was complete at last. Three pints of blood had been put forward, by three subjects, in devotion to this Dread Novitiate's calling to the Knighthood of the Ebony Scepter. He had proved to hold a popular support among his peers - but the service of his subjects would be worth nothing until he conquered the consequent Rites that lay before him. There was no room for failure - and thus, he set his face only forward.